Black Construction Corporation (BCC) was initially awarded a $11,600,000.00 subcontract by prime contractor Overland Federal, LLC under the SB-MACC Program for the design management and construction of the FY10 MCON P-204 Wharf Improvements (Uniform & Tango) Phase 1 (Secondary Part E) under U.S. Navy Contract No. N40192-10-D-2803-0006. The original completion period was 570 calendar days. Thereafter, five (5) owner requested contract modifications extended the project completion date by 673 calendar days and increased BCC’s total subcontract amount to $12,178,771. The project scope entailed to reconstruct and strengthen approximately 305LF of Tango Wharf with a new Hat type sheet pile and H-shape king pile combo sheet pile wall and concrete bulkhead beam anchored by tie-rods to new back of wharf H-piles and concrete anchor cap beam. 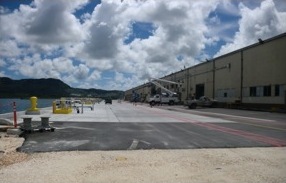 Project also includes demolition, relocating/reconstructing an existing generator building, new concrete deck and asphalt paving, mooring hardware, concrete utility trench and replacement of site water, fire, electric power, telecommunications, and storm drain infrastructure for cold iron berthing US Navy Amphibious Readiness Group (ARG) and Joint High Speed Vessels (JHSV) “extended” transient ships at Tango Wharf, Naval Base Guam. Sustainability target is to achieve the most LEED-NC credits practical given the mission, purpose and scope of the project.